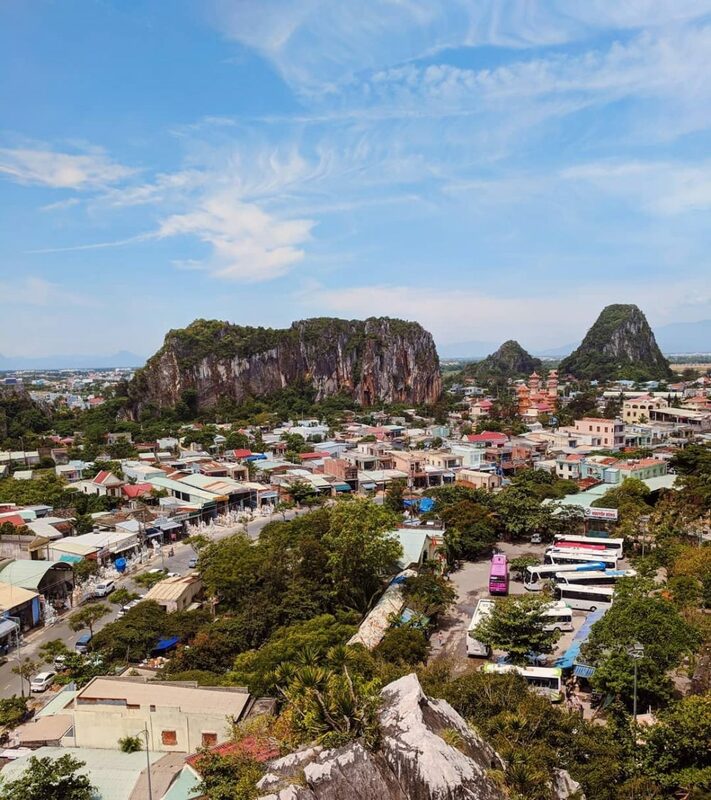 About 8km southeast of Da Nang’s city center are the Marble Mountains. It is full of historical and cultural values, which make it one of the most tourist-attracting sites in Da Nang. Nowadays, the site is filled with technology and ancient things, it’s truly a representation of Vietnam’s development. The place is full of tourists most of the time. Therefore, if you’re going alone, it’d be a bit confusing. And that’s why I’m creating this guide, to help you know more about it and what to do. The name ‘Marble Mountains’ wasn’t created by the Vietnamese, but rather the French after they studied this place. The Vietnamese often called this place ‘Ngu Hanh Son’ (Five Elements Mountain). There are five mountains in accordance with the five elements of nature: Kim Son (Metal Mountain), Moc Son (Wood Mountain), Thuy Son (Water Mountain), Hoa Son (Fire Mountain), Tho Son (Soil Mountain). Each mountain is unique in shape with their own layout of caves and shrines. There is also a wide range of rare herbs and animals in Marble Mountain. Besides the flora and fauna, it’s also full of cultural and historical value, represented by multiple caves and shrines. In the past, it was a popular destination for noble classes and royals to visit. This place is also a destination for monks of Mahayana Buddhism to establish temples. Still, the history of this place can stretch as far back as hundreds of years before that, when the south half of Vietnam still belong to the Cham Kingdom. Even now, whenever you visit Marble Mountain, you can still feel the depth of its history. A sneak peak of what’s inside Marble Mountains. Discover Marbles mountain and other fascinating things to do in Hoi An with Inspitrip now! You can get to Marble Mountains easily by taxi, bus, or “Xe ôm” (motorbike-taxi). With Grab (Uber for motorbike) you can get there easily (and still won’t break the bank). So always remember to utilize the app to the fullest. But if you want to drive there yourself, here’s are the directions. From Da Nang’s city center, you can cross one of the three main bridges of Da Nang (Han River Bridge, Dragon Bridge, and Tran Thi Ly Bridge). After crossing the bridge (no matter which one you chose), you’ll reach Ngo Nguyen Street. From there, continue heading south (or left, to make things easier) until you reach Le Van Hien Street. Follow it for about 2km and turn onto Huyen Tran Cong Chua street. After that you’ve reached the Marble Mountains. The drive is about 8km, so it shouldn’t take much time. Marble Mountain is open daily from 7 AM to 5.30 PM. Entrance fee to Water Mountain is 40.000VND (US$ 2.00). If you don’t want to climb the stairs you can pay 15.000VND (US$ 0.75) to ride the elevator to the top. You can visit Hell Cave for 40.000VND (US$ 2.00). Marble Mountains is gorgeous no matter when you see it. But it’s at it best during Summer (June-September). 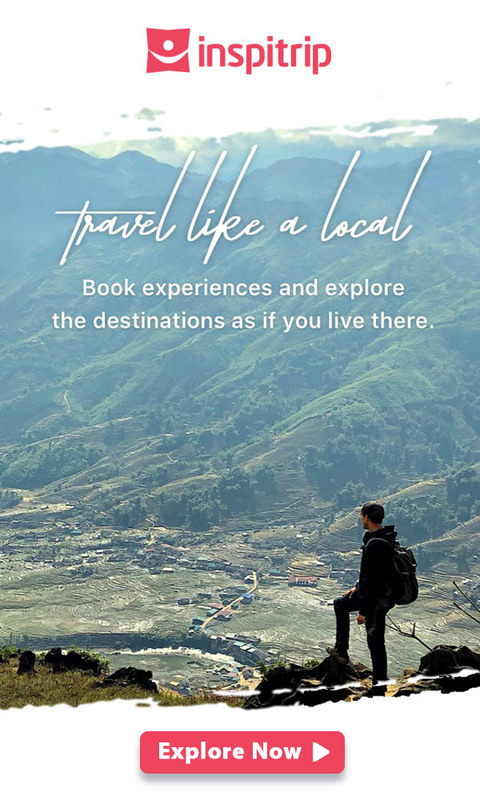 If you’re traveling in Summer, not only will you experience the mountain clusters at its finest but also experience Vietnam at its most beautiful time of the year. Remember to wear breathable clothing, because there will be a lot of stairs for you to climb. And always bring water with you, tropical heat is not something you want to trifle with. You may want to avoid traveling from October to December. Because it’s typhoon season in Vietnam. The weather can be extremely unpredictable and the stairs can become very slippery as well. Visiting Marble Mountain early in the morning is the best. You can avoid the traffic and explore the place before it gets too crowded. And after you finished exploring, you can head to Hoi An for the evening as well. Among many shrines and pagodas here, this one is definitely the one you don’t want to miss. It’s a witness of history and also contains great cultural values. When in Water Mountain, head West and go up 156 steps and you will find yourself in front of a three-entrance gate leading to the pagoda. 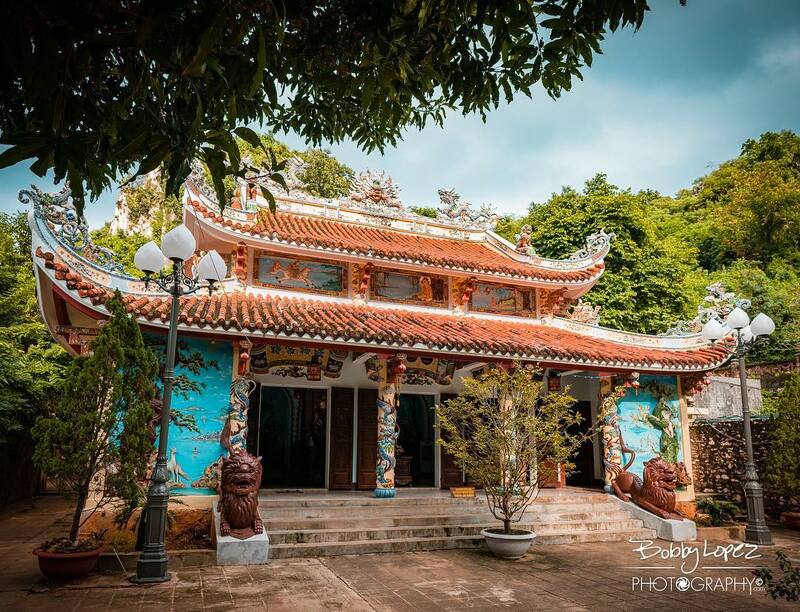 Located in the west of Thuy Son mountain looking through the West, the pagoda was built in 17th century (1630) and was restored 3 times in Minh Mang and Thanh Thai dynasty and in 1970. It was built in the 17th century, making it around 400 years old. It was heavily damaged during the Tay Son rebellion and was mostly rebuilt by Emperor Minh Mang in 1825. The Vietnam War and the typhoon of 1991 also damaged it. Despite going through rough times, the pagoda is still there, welcoming visitors and believers alike. This cave is very famous among tourists for its beauty. Its beauty doesn’t lie in its physical form, but in how light moves through the cave. 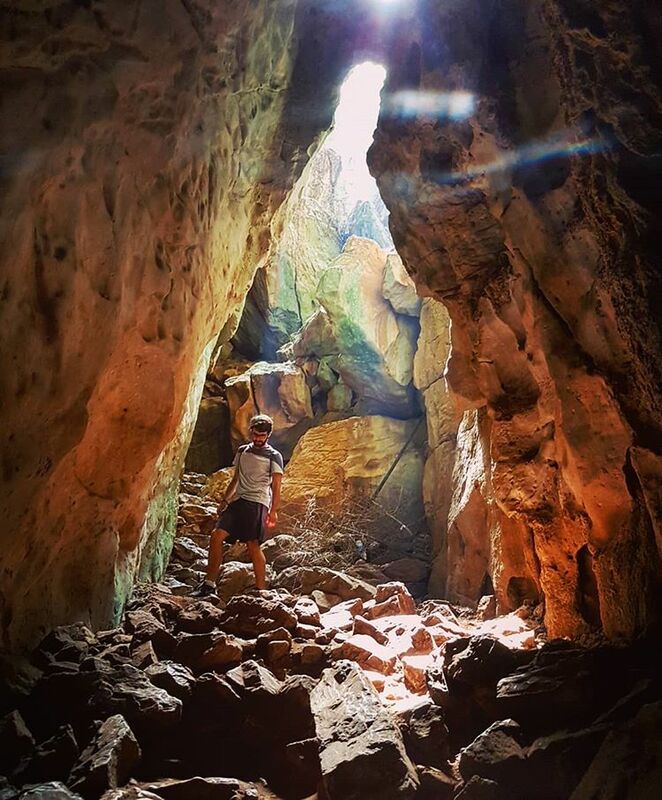 The way light moves through this cave can surely make anyone drop their jaw. Just picture sunlight “lightly” shining on the Buddha statue in the cave; it’s a marvelous scene to witness. The Buddha statue inside was made relatively recently, around 1960. 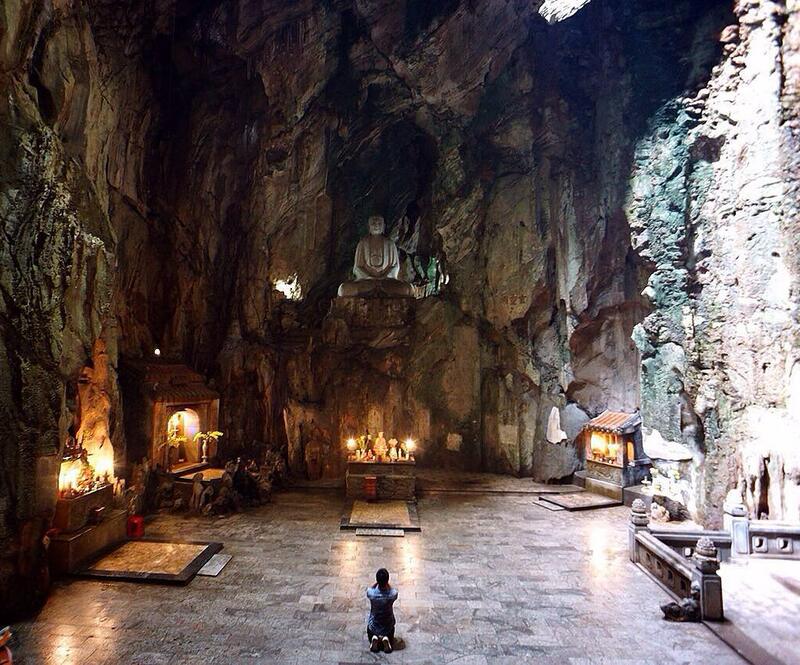 The Sacred Huyen Khong Cave with the great value of spirit. Going further into the cave, you can see the Trang Nghiem Temple, built in 1825. It has three compartments. The main compartment, the one in the middle, is where people enshrine Bodhisattva. On the left, people worship three gods: Guan Yu, Guan Ping and Zhou Cang representing Morality, Wisdom, and Loyalty. Conversely, on the right, they worship the god and goddess of match-making. Couples often come here to pray for a long and healthy relationship. 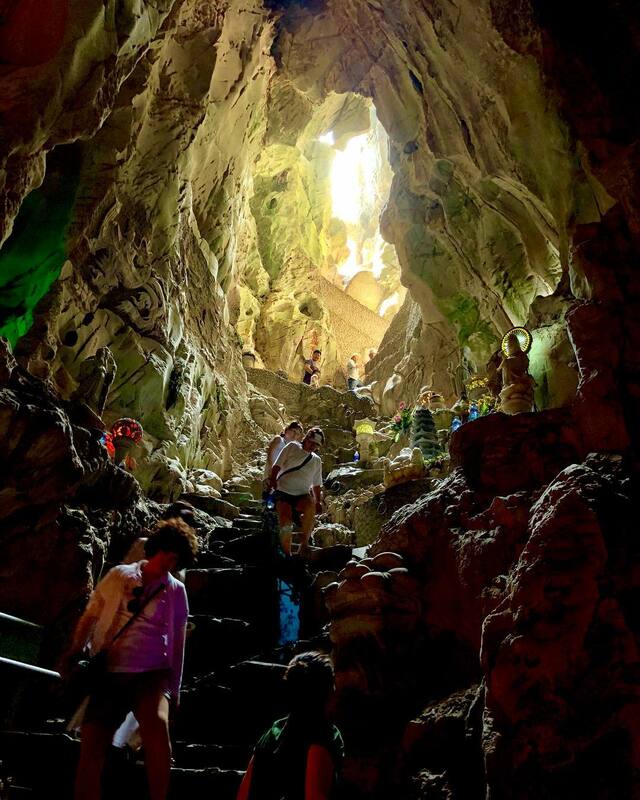 Huyen Khong Cave, along with the Marble Mountains, has been a great witness to history. During the first Indochina War, this cave became a secret base for the local revolutionary officers. With the Vietnam War is going on, the South Vietnam Government made this place an army exercising venue. In 1968, the Viet Minh turned the cave into a medical ward. Opposite the heavenly feeling of Huyen Khong Cave is Hell Cave. Going through this place gives you a feeling that’s deserving of its namesake. It feels dark, humid, hellish and straight up scary. It truly represents hell, with creatures hiding in the dark and stairs that lead to creepy scenes. Guarding the cave are two statues, Sir Good and Sir Bad. Hell cave is around 300 meters long, with great height. The cave is beautifully crafted, the sculptures inside represent the core of Buddhism, Karma. In Hell cave, Karma is shown through scenes of bad people getting tortured. The more sinful they are in their past life, the harder the punishments. The cave also tells the story of Maudgalyayana. He’s a Buddhist monk trying to save his mother, who’s suffering in hell due to her sins. At the end of the cave, you can see a scene of Maudgalyayana talking to his sinful mother. Although he couldn’t save his mother, he still chose to practice Buddhism. From his story, people made the full moon of July in the lunar calendar the Ghost Festival, where children honor their parents. This mountain was a great shelter for the Cham before they were conquered by the Tran Dynasty. You can still see ruins of Cham Temples, these temple structures are very similar to the temples in My Son, because the structure of these shrines is inspired by Hinduism, the main religion of the Cham. This mountain is a not-so-popular part of the Marble Mountains, for there aren’t many relics with historical or cultural values. But you can still give it a quick look to make your tour of the Marble Mountains more complete. The Statue of Bodhisattva. On special lunar occasions, Vietnamese people usually bring offerings here and pray for health, wealth and happiness. The cave is 64 meters long, 7 meters high and 7 meters wide. 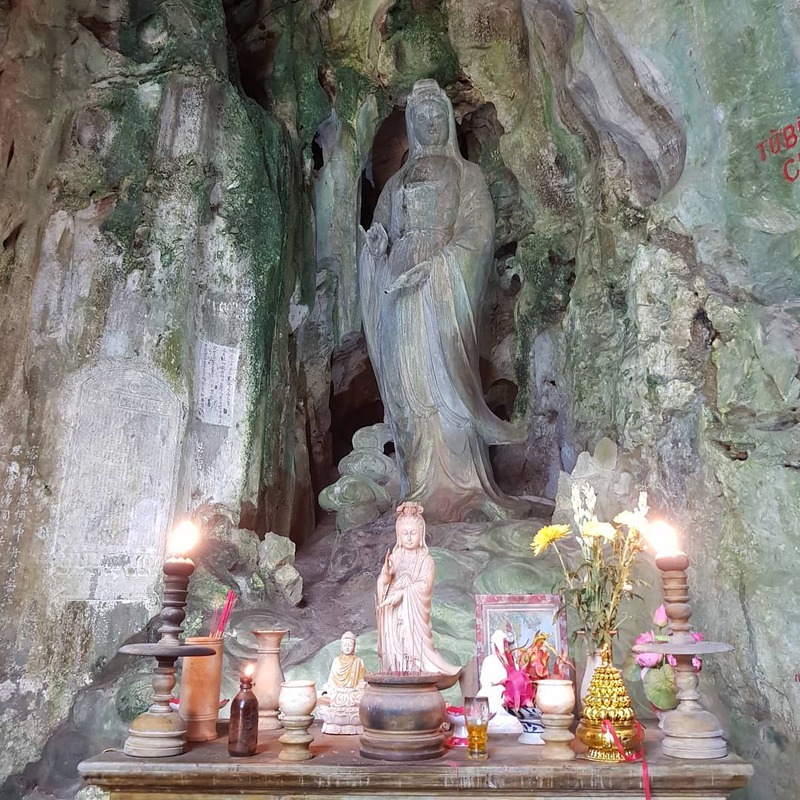 The most impressive thing in this cave would be the human-size natural marble sculpture of Bodhisattva, which people believed to have magical power. There’s also a natural clear water pond in the cave. The pond’s water comes from Co Co River, through various rock layers, giving the water its clearness. Fire Mountain is the combination of two mountains, connected by a rock road. Each mountain heading their own way, people called them the Negative and the Positive. It’s also chock-full of things for you to explore. You can pay a visit to Linh Son Pagoda (with Huyen Vi Cave) and Pho Da Son Pagoda (with Pho Da Son Cave). There’s also Ung Nhien Pagoda, the pagoda on the path connecting the two mountains. Long ago, this mountain used to be a majestic and gorgeous place. But through years and years of heavy exploitation, the mountain looks like an old wall that was abandoned. There are lots of things to see in the Marble Mountains, but Wood Mountain doesn’t seem like one. You can visit it to make your trip to the Five Elements Mountains more complete. Many centuries have gone by since Vietnam got a hold of the southern part. The Marble Mountains have witnessed wars and suffered natural catastrophes. The historical values of this place are undeniable. So I highly suggest you visit the place yourself, to experience it first hand. And I hope that this guide will be useful to you in many ways. In addition to Marble Mountains, there are still so many things to do in Hoi An. 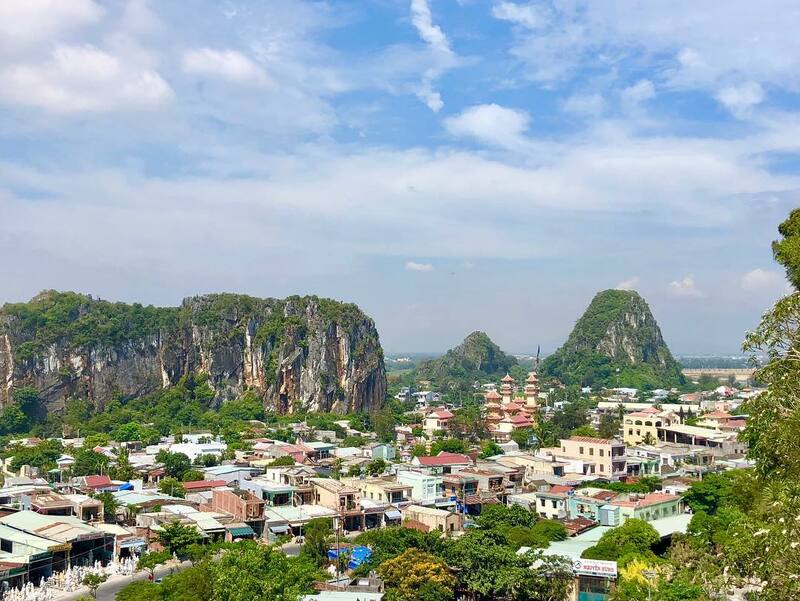 You can visit Marble Mountains in the morning to explore the sacred beauty of the pagodas and caves, drop by Tho Quang fishing village to have a tasty lunch with local specialties then enjoy a laid-back evening in a random yet aesthetic coffee shop in Hoi An ancient town.